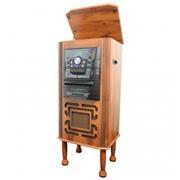 Enjoy your favorite music with the help of this classic-styled entertainment system. Constructed MDF wooden walnut color cabinet, this floor standing retro vintage turntable jukebox is packed with features that’ll have you enjoying it all. Comes equipped with AM/FM radio, 3 speed selectable turntable (33, 45, 78 RPM), CD player, double cassette deck, and Aux Input jack lets you connect your iPod or other MP3 player and stream music directly through the system’s speakers Hear your music like never before with this versatile, next-generation full-range stereo speaker turntable entertainment system.